Wedding table decorations are a great inspiration especially when you have pictures of different styles. 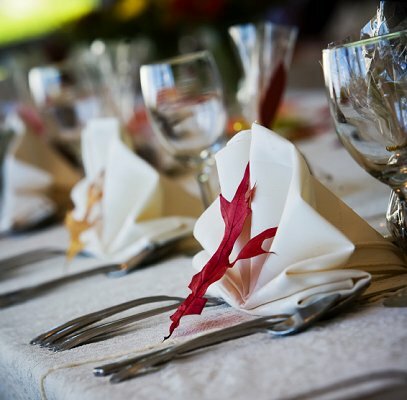 Pictures that show wedding themes, colors and lighting options are the best resource for planning unique table decorations. With a little creativity, you can have stunning decorations for all your wedding tables, including the head table, cake table, the sign-in and/or gift table, and guest dinner tables. Sometimes simpler is better. A simple, casual look is perfect for an outdoor wedding. Your cake can be a gorgeous focal point. Make a splash with wedding tables decorated with beach pail favors, flowers, and candles. A fountain makes a gorgeous wedding cake table decoration. A combination of fruit, flowers, and candles creates elegant wedding table decor. Small details like place setting decor add a special touch. Favors do double duty as table decor. Looking for eco-friendly decor? Use natural materials in wedding table centerpieces. A dramatic table centerpiece and coordinated tableware can be beautiful, natural, and elegant. Bright, bold use of color makes for unique wedding table decoration. Table decorations can change with the season. For awesome autumn ideas, check out the Tables Set for Fall Wedding slideshow.